THE DOTHAN FCA 2018 ANNOUNCES FIELDS OF FAITH :: RickeyStokesNews.com! Dothan, AL, September 10, 2018: The Wiregrass Fellowship of Christian Athletes is excited to announce the details of its 2018 Fields of Faith Rally. This annual event has been nothing short of fantastic! We are in great anticipation of what The Lord has in store for this year’s event! The purpose of this event is to bring students from all over the Wiregrass Region to worship God together. Area schools compete with each other all year long in athletic events, but on this night, students will come together as one team – Team Jesus Christ – in order to fellowship with one another and worship Him. Fields of Faith also encourages students to make a commitment to read God’s Word daily and engage in a deeper walk with Christ. Every year is bigger & greater; last year’s Fields of Faith was no exception. It was absolutely incredible! It was the largest gathering in Alabama with over 2,200 people in attendance. The most amazing sight was witnessing 2,200+ students sit in complete silence for one hour in awe of the presence of God. 243 of those students responded by surrendering their life to Christ! Fields of Faith 2018 is going to be huge. We are expecting this year’s attendance to be even larger. Guest Speaker Rick Burgess, speaker & co-host of the syndicated radio talk show “Rick & Bubba” This event is free and open to students and adults throughout our community. 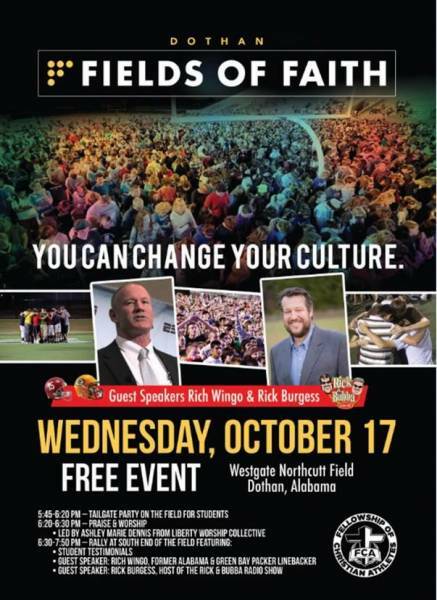 Again, Dothan’s Fields of Faith 2018 will be held on Northcutt Field at Westgate Park in Dothan, Alabama on Wednesday, October 17, 2018. A breakdown for that evening’s schedule is: 5:45 p.m. – 6:20 p.m. – Free tailgate party on the field for students 6:20 p.m. – 6:30 p.m. – Praise and worship led by Ashley Marie Dennis from L.W.C. 6:30 – 7:50 p.m. – Student Testimonies, Message from Rich Wingo & Rick Burgess. Adults are invited to bring their lawn chair and join us on the field at 6:30 p.m.